The lobe-finned fish and tetrapods on either side of the transition from sea to land have been studied extensively. A detailed knowledge of their anatomy is vital if we are to understand the anatomical changes which turned a highly unusual group of fish into the first tetrapods. Most of our knowledge has come from the discovery of new species. However, a recent study by researchers from the University of Bristol's School of Earth Science and the University of Cambridge has shown that even fossils of well known species can still yield surprises. Eusthenopteron has been known about since 1881, and over 2000 specimens have been collected, giving us excellent insight into its anatomy. Nearly two metres in length, it was a top predator in its ecosystem of shallow lagoons 385 million years ago. Its importance lies in its fins, which lie close to the transition pathway and legs. Re-examination, however, has revealed that an aspect of its anatomy has been overlooked, specifically a new bone in its jaw - a structure not fully described before. The researchers, led by Dr Laura Porro from the Royal Veterinary College, used cutting-edge software to digitally strip away rock from fossil bone and separate individual bones and teeth from each other. 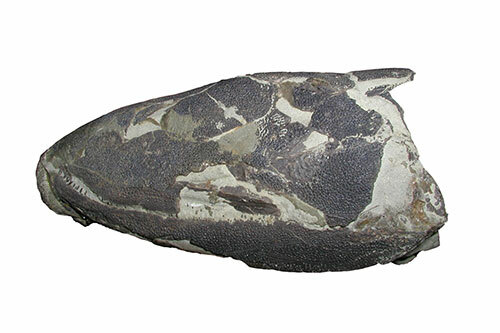 The structure, which had been recorded in other species of lobe-finned fish and tetrapods, was assumed to be either a broken fragment or an extension of surrounding bones. The CT scans demonstrated that it was an entirely new structure. The researchers have called it the postsymphysial because it occurs immediately behind the area where the right and left halves of the lower jaw come together - the symphysis. 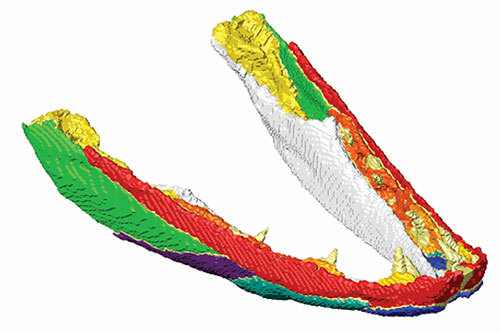 The revised jaw structure of Eusthenopteron has given insight into its feeding methods. Earlier studies suggested that because of its strongly fish-like appearance, Eusthenopteron captured its prey the way most modern fish do – using suction. The size and distribution of its teeth and the shape of contacts between individual bones on the other hand suggest it may have also used a strong bite to tackle larger prey. In the predator-filled lagoons of the Devonian, a strong bite would have been a great asset.